I love to write poems, short stories ( fiction or non-fiction)… but sometimes I need a muse and the perfect mood to start with a new one. Well aren’t we all writers feel this way? Since, I started my Art Game, I noticed that I gained more friends. ( I prefer to call my followers as my friends or buddies here in the blogging community). Although all are not participating but in one way or another I get to know other bloggers through them. Awesome, isn’t it? Because of this I thought of something for those who just love to write like me… so how about we do something “For The Love Of Haiku”? And that is how I’d like to call this some kind of fun or mind-game. Every first week of the month (revised) I will post an image that I got from my Art Game and then you write down your Haiku based on what you see on the image. You can check previous For the Love of Haiku posts to get more inspiration. Haiku is a wonderful form of poetry. Its formal structure of 17 syllables divided into three lines of five, seven and five syllables. Although it can be useful to impose such a structure when first approaching this old Japanese form of poetry, a deeper understanding of the component parts is essential to a clear appreciation of the form and its purpose. Five-seven-five haiku are often referred to as “strict form” and poems without this structure are known as “free-form“. In the main, however, haiku writers arrange their poems over three lines, with the second invariably longer than the other two. 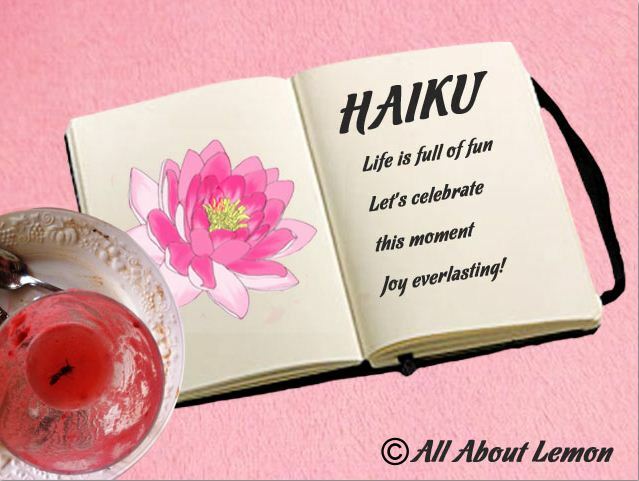 English language free-form haiku are on the increase as more people notice that English can provide the same amount of information in fewer syllables than an equivalent Japanese work. Thanks – I can’t seem to figure out how to link my haiku. I guess my heart must be slowing down. Can you list a few blogging for dummies tips ??? Thank you so much Ron for your visit back, I highly appreciate this from you… I enjoyed reading some of your haiku… I’m speechless, you are very talented! Oh, well, I’ve retrieved a few of your comments from my spam folder, too, so it had to be my turn eventually D: WordPress is being very quirky at the moment. There must be too many of us to handle. Glad to hear that For The Love Of Haiku is returning soon. Hope you’re having a wonderful break. I’ve just completed the first draft of my novel today, so will be writing a post about that soon. Do go and say “hi” to him there, as we wouldn’t want him to feel like a lonely shipwrecked pirate, would we? And if he gets the highest number of votes this week, we will need to send him a message in a bottle to tell him he’s a winner! Perhaps, dolly, if anyone wants to vote for his haiku now and can’t, they could leave a vote as a reply to my message and we can count them here. What do you think? Hi, thought I’d try an entry! !